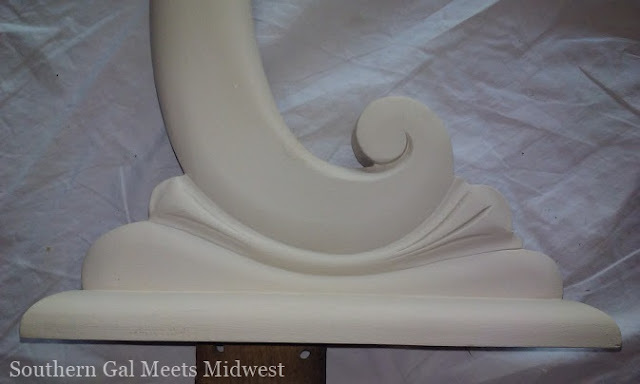 I have this kinda love for ornate furniture...you know the curvy lines and detail. Hmmm... just minding my own business when this little lovely called my name. She had several coats of paint and you can see on top where there is paint missing in spots. That's where I started peeling the contact paper off of it, immediately! That's right, I was so anxious I started messing with it before taking a picture. My darling takes me out for Starbucks and shopping pretty often and he knows my preference, not the mall but any thrift store in town. There is one in particular that has the biggest selection of furniture ever. I lost a hutch one time there because of my indecisiveness. That was not gonna happen again. We checked it over to make sure it was made well and found this tag. I googled this name to get more info about the manufacturer on the tag. 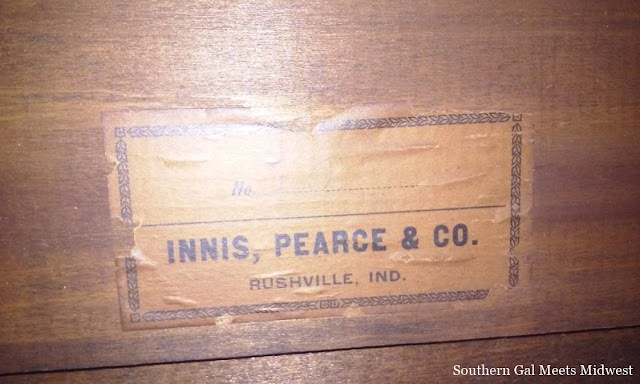 This furniture company was based in Indiana and has been around since 1883. 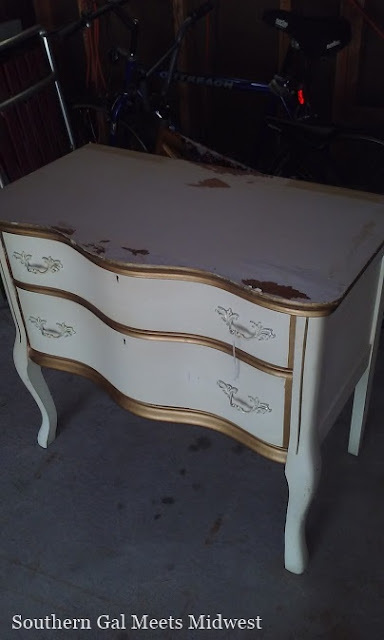 It does not tell me much about the value of the piece but it satisfied my curiosity and looks very sturdy. There is a swivel mirror that was attached (did not have my camera) and my darling had to remove it to fit in our vehicle, talk about a tight fit...but we made it work. I decided to mix up my own chalk paint from some paint that was saved from being thrown out. You see, I work for a commercial painting company so when a job is finished and there is leftover paint it is stacked out in the shop on pallets. If anyone wants it you just put your name on it and take it home. Pretty nice perk huh. I took two 5 gallon buckets since it is a neutral beige color. Darling said, "that's way too much paint, you will never use it all" What does a DIY chick do with 10 gallons of neutral paint?? 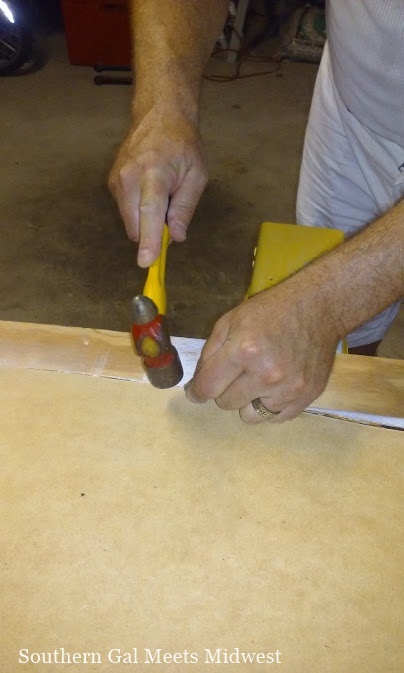 After many hours of stripping and getting a couple of burns on my fingers it was time to start sanding. 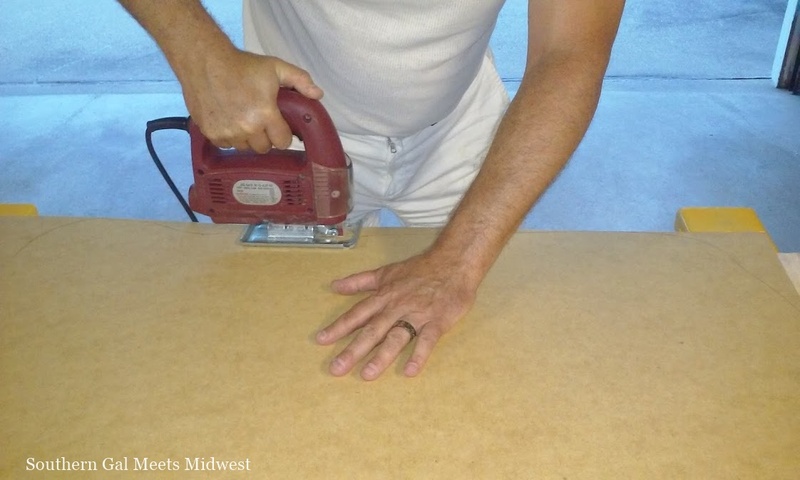 I used my darlings electric sander and got all the flat surfaces. 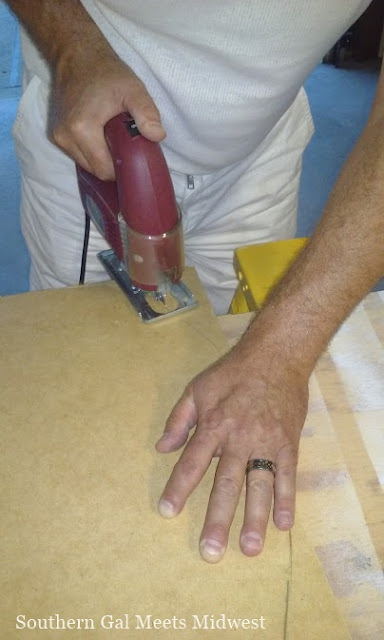 Then a sanding sponge (medium grit) was used for all those curved edges and hard to get at places. She is now sanded and prepped for painting which is the fun part...Yea!! 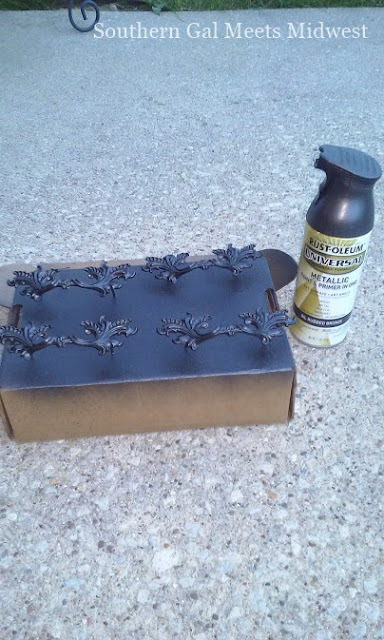 My day off was saved for the actual paint application. I got everyone out the door to work and school, put on some 80s music and got to work in the garage. 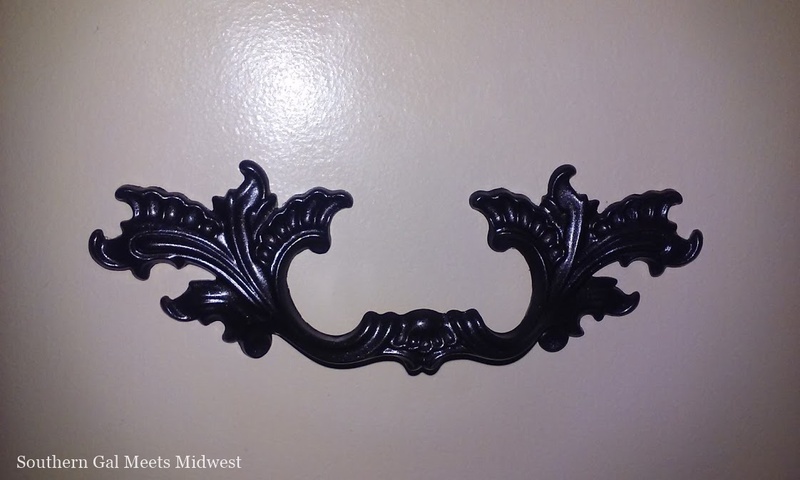 Here is a close-up of the painting done on the mirror attachment. 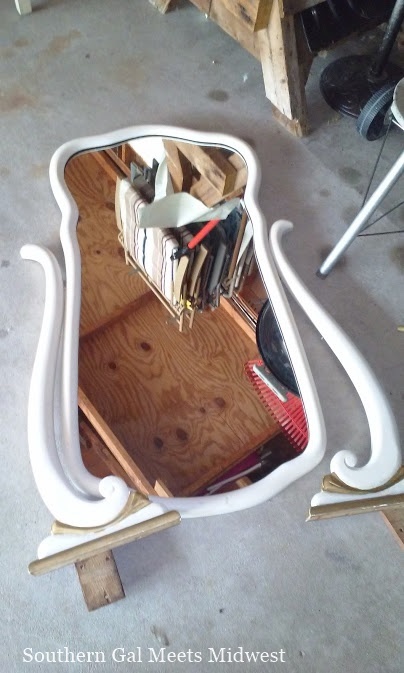 Next in line was the back on the mirror. It looked just dreadful and like it had been removed many times over the years. 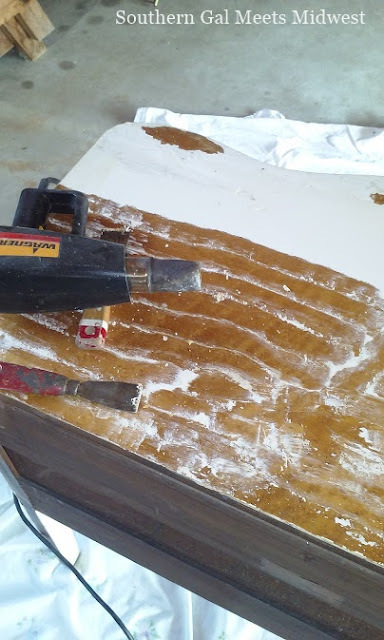 I was fairly certain once removed again there would be nothing left to reattach so my darling set out for the hardware store and picked up some thin board. Honestly I don't know what its called or the actual thickness of it but it looked way better and cleaner than what was already on it. it was time for me to check the drying process of the hardware I had spray painted earlier. I used an old box to stick nails in, each one far enough apart to hold the hardware up off the surface so they could be painted & dried all in one step. I used more of the oil rubbed bronze leftover from the lamp project. Dry!! Looks like my dresser will make it to my room before the day is over. The hardware is really standing out now, don't you think? lots of character and detail. My granny made this doily many years before she passed on. I think it looks very nice and I am sure granny would like it too. My darling is quite happy with this makeover and I am very thankful for his assistance in getting it finished and moved in our room. It's such a nice feeling to look at this piece and know it is gonna be with us for a long time to come. French provincial...thank you. It was a lot of fun and I'm on the lookout for that dining hutch to work on next. Mimi...you are way ahead of me. 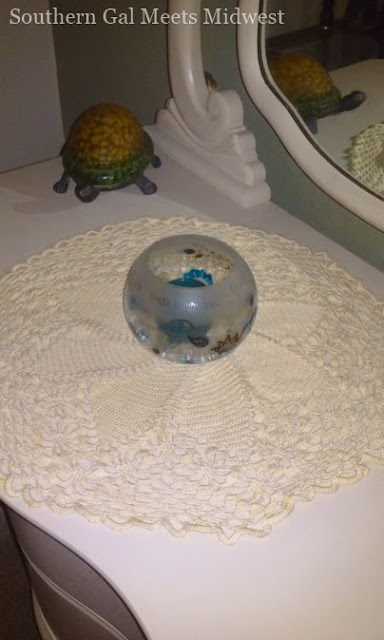 Granny taught me to crochet as a teenager but I did not stay with it. My Auntie Thelma has offered to give me a refresher course so I can pick back up where I left off. It's time!! Thanks so much for stopping by. See you soon. 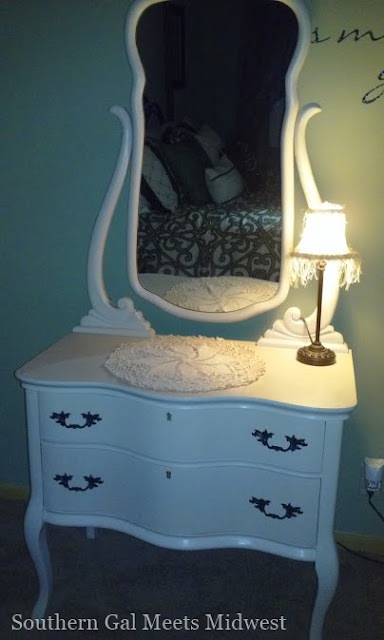 your dresser is beautiful, it was definitely worth all the hard work! I've enjoyed browsing thru your blog. Thanks for visiting and following, I'll be back to visit! Hi Karen! I can't even believe this is the same piece of furniture. Such a gorgeous transformation. Your husband is so wonderful to help you give this beauty the new life it deserves. Thank you Brandi, we had a great time with it and yes he is such a sweetie to help me. Its very nice to meet you and I hope you have a wonderful week! 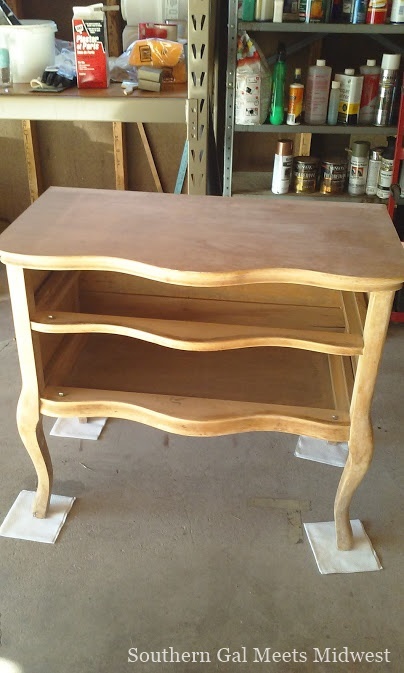 Karen, great job in your dresser, it looks wonderful. 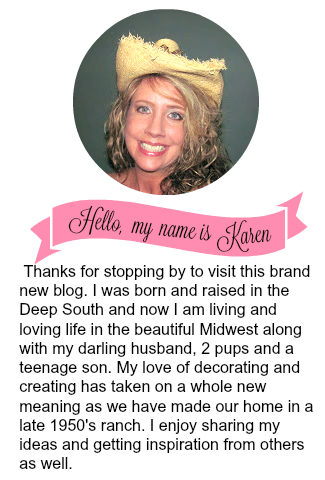 Thanks for stopping by my blog too! Thanks Kelly, so nice to meet you today. Have a wonderful week! Absolutely gorgeous! The hard work definitely paid off :) Have a lovely week, Karen. Hugs! What a beautiful piece Karen. You and Mr. Darling done an awesome job. I love it when all the hard is done and we can look back and go...WHEW...BUT AWE! WOW....you are blessed to be able to get some freebies on paint girl. My kind of girl...looking for ways to make things beautiful and with that comes hard work at times. Happy Thanksgiving. Hugs and blessings, Cindy P.S. Thanks for popping over to see me today. Made me smile! Good Day Celestina, We had a great time working on this piece and are looking forward to the next one we can get our hands on. Thanks so much for your sweet comment. Have a wonderful weekend and Happy Thanksgiving. Thanks so much for stopping by!! This is one amazing transformation!! Love it!! Joe only has that one space in the house , which he is perfectly okay with, so I had to decorate it for him with a bit of Christmas cheer!! Thank you Darrielle...Have a wonderful weekend! 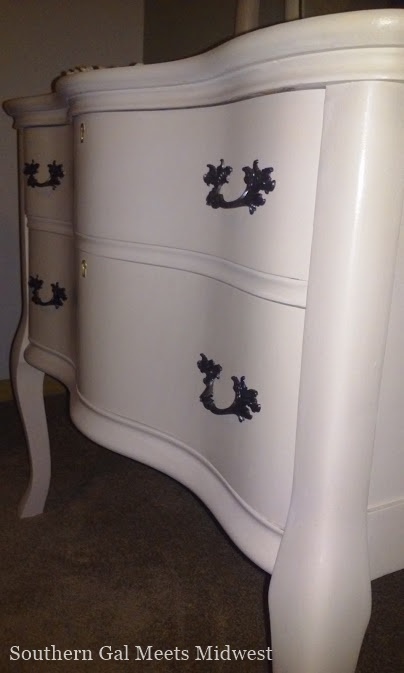 The dresser is gorgeous, Karen! I'm a new follower after readinf your spotlight over at Kris's.